The Search Bar allows users to quickly locate file(s) and folder(s) within Thru Web. 1. Type your search parameters. 2. Click Search. Perform searches of the files that you have within your Thru server. You can also use Wild Card searches within this field. A phrase is multiple words enclosed in quotation marks (“). This is necessary for exact matching on multiple words. For example if you had a tag “apple juice”, in order to match that tag you would need to put quotes around “apple juice” in the search. If you did not put quotes the search would match “apple” and “juice”, but not “apple juice”. 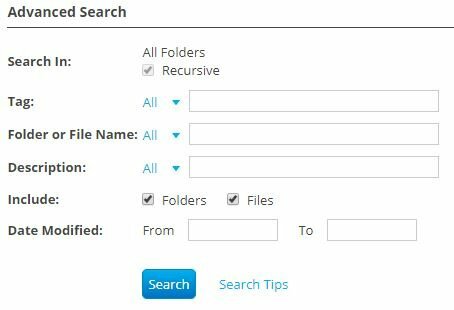 If your search involves advanced parameters, click Advanced Search where you can filter searches in Thru Web based on file name, folder, user, date, etc.